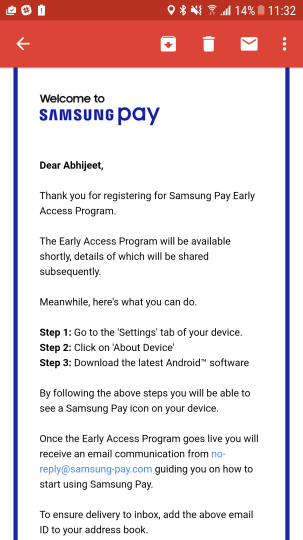 If recent developments were not enough to suggest that Samsung Pay India launch is imminent, the South Korean company has now started accepting registrations for early access to the service in the country. 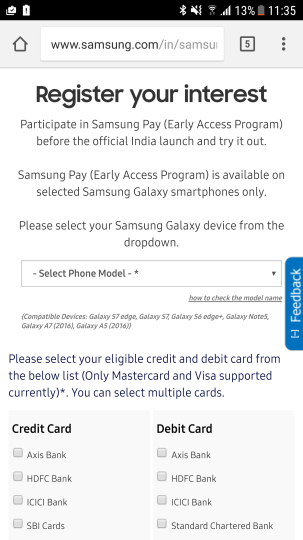 Those owning a Galaxy S7/S7 edge, S6 edge+, Note5, Galaxy A5 (2016), or Galaxy A7 (2016) are eligible to sign up. The service currently supports credit and debit cards (MasterCard and Visa) from a handful of banks including Axis, HDFC, ICICI, SBI, and Standard Chartered. Citibank will be added to the list soon. Reports say one should avoid registering to the early access program through Chrome Web browser. Also, in case there's some error upon submitting details, keep trying until it goes away. Keep in mind only the registrations have begun, and there's no word on when the early access program itself will kick off. Successfully completed about 7 transactions using SBI credit and HDFC debit cards. Sellers getting shocked seeing this method of paying :). Except one instance, it worked everywhere. Keep phone near where card swiped, enter amount and enter pin. I am an indian ! In india very few banks use nfc system or android pay ! dnt know it will actual work here !